From the face cold department... 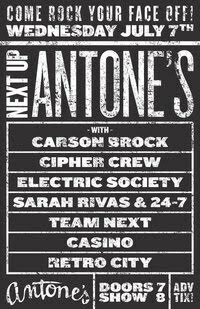 The Cipher Crew @ Antone's this Wednesday for Antone's 35th Anniversary! In 1999, formerly homeless teen Chris 'Kazi' Rolle created The Hip Hop Project through New York City's Art Start program. Despite common struggles faced by youth artists, the participants produced their own collective hip hop album, and in the process, gained confidence in their abilities, higher knowledge, and life skills towards a positive future. A documentary of The Hip Hop Project (produced by Bruce Willis and Queen Latifah) released in spring 2007 has inspired other cities to create similar programs. Complementary to the original, The Cipher - Austin's Hip Hop Project is on a mission to build a community of young leaders and engaged hip hop artists and to strengthen the East Austin community in multiple ways. The creative expression and public performances encouraged through "The Cipher" create a group of confident and engaged young people. They leave our program empowered, authentic and connected to the Austin music and poetry community. The program provides these young people with positive learning experiences through which they gain new skills and competencies, build self-esteem, improve academic performance and expand possibilities for their futures. ci·pher (sī′fər): a circle of energy ignited by a community as they express artistic ideas.